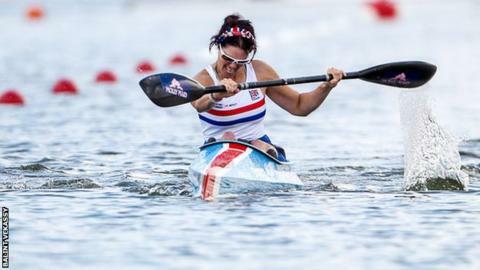 Great Britain's Para-canoeists have won three more golds at the European Sprint Championships in the Czech Republic. Emma Wiggs finished second in the KL2 race but was promoted to gold after initial winner Cindy Moreau was disqualified but then re-instated. The team tops the medal table with six at the end of two days of competition. Chippington, who represented GB at five Paralympic Games as a swimmer, winning two gold, four silver and six bronze medals, was in commanding form in Racice, beating Germany's Edina Muller by 3.080 seconds in her final. "It's a fantastic feeling having retained my European Championship title," she said. "It took a couple of hours to sink in and I'm now feeling really pleased and proud of myself." Marsden finished in a time of 52.844 seconds - over two seconds ahead of the rest of the field. "It's the first time I've been ahead from the start and I just did my race regardless of what was happening either side of me," he said. "I wasn't fully aware that I was first over the line as I couldn't hear any beep and you can never see the outside lane."